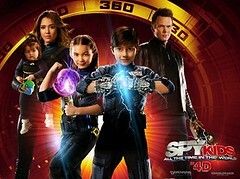 Spy Kid 4D has no 4D aromascope effect – supposedly the “joy” of experiencing the smell and feel of the film. It has not retained any playful, fantastical element of the first film, not even Antonio Banderas! On the contrary, Spy Kid 4D is quite transparent in its agenda – the fast food joint merchandise. Robert Rodriguez – really? Where has the Rodriguez of Sin City and Planet Terror disappeared? After watching the fourth installment of the Spy Kids series, I happened to pass by a McDonalds – where I was bombarded with more merchandise from Spy Kids. It makes me wonder – is this the same director? Spy Kids – All The Time In The World or Spy Kid 4D is the fourth movie from the Spy Kids series, dealing with a Spy Kids department that has now become world famous in solving crimes. It is sparked off from the first movie where kids Carmen and Juni (Alexa Vega and Daryl Sabara) help their parents (who are spy agents) with an espionage mission. Spy Kid 4D tells us about the aftermath of the success of the OSS (world’s top spy agency). Jessica Alba joins the film with her two step children Rebecca and Cecil (Rowan Blanchard and Mason Cook) to fight against a sinister Timekeeper (Jeremy Piven) who attempts to take over the world. To be fair, the first movie, plain and simple Spy Kids, was a fresh film filled with mazes, codes, pranks and anagrams. It gave many children that fantastical space, which was unexplored before the Harry Potter series. But as we’ve seen with many films (especially with children’s films in Hollywood) – by the 4th installment you have a star to make the film’s worth triple fold (Alba) – high technological placing (4D, and we’ll take about that later) and no story. It’s pretty much like a moving, technology spewing version of the very toy I see at fast food joints. Alba takes her kids along with her on the mission, and so Rodriguez manages to throw in a few laughs here and there – all of it banks on the scatological humour, which does work with most kids. But other than that it seems like he’s written the movie in his sleep. The overall effect of the film – with its watered down visual effects, bad chroma backgrounds and horrid acting on almost everyone’s part is not worth your time, to put it mildly. You almost wonder if the film was made for lesser than Rodriguez’s $7000 debut El Mariachi. The Indian release however has not seen a 4D effect at all. The film promises a 4D Aromascope effect which allows you smell and feel the film as well. Except, I was given regular 3D glasses and nothing more. And I’m not even surprised. I’m told not many multiplexes in the country have actually followed the 4D scheme. The film does have a Rodriguez watermark on it though – we see a few witty moments and the entire series is Hispanic dominated, one thing that remains a constant. Kids will find the robot dog (voiced by Ricky Gervais) pretty amusing, as he’s stupid and funny with the humour. For those who have been following the series, Antonio Banderas and Carla Gugino (parents from the previous films) will be missed – but much respect to them for staying out of this one. I was all set to write a super nasty piece on how Hollywood is considering kid’s entertainment the biggest commercial venture of the decade; and then I realized something. If Robert Rodriguez gets the leverage to indulge in independent films like From Dusk Till Dawn series, Machete and other classics like The Faculty and Desparado – because he makes commercials sewers like these, I think we can allow him this mistake.